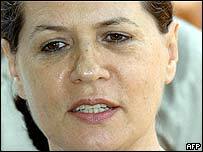 India's Congress party leader Sonia Gandhi says she will not be the country's next prime minister. "I must humbly decline this post," she told shocked Congress party MPs, just days after a surprise election win. Mrs Gandhi, whose mother-in-law Indira and husband Rajiv were assassinated, said she faced no threat but had never set out to be prime minister. Stock markets have been volatile since the defeat of the governing BJP, which has criticised her Italian origins. Congress party MPs are expected to meet on Wednesday with some reports saying Mrs Gandhi will nominate her preferred candidate for the post of prime minister. It is not clear if the MPs would simply accept her decision or take a vote on it. Mrs Gandhi's emotional announcement late on Tuesday sparked uproar among Congress MPs and there were emotional scenes in parliament's central hall in Delhi as they pleaded with her to reconsider. Mrs Gandhi went into little detail about her decision. She told her MPs she had decided to listen to her "inner voice". "I must abide by the principles that have guided me all along. I appeal to you to understand the force of my conviction. "There is no threat to me from anywhere. I want to give India a secular government that is strong and stable." Angry and upset Congress MPs told her millions of voters had given her a mandate to govern and urged her to ignore attacks over her foreign birth. One tearful MP, Renuka Choudhury, told Mrs Gandhi it was the party's request "that you continue to lead us, because it is the need of the hour". "Not just for women, not just for children, but as a human being who has upheld the finest tradition of what it means to be an Indian." Markets rallied on the rumours of Mrs Gandhi's decision and reports that the architect of India's reform programme, Manmohan Singh, was being tipped as a front-runner to be prime minister. Mrs Gandhi's announcement capped another day of drama in the Indian capital, which began with her going to see President APJ Kalam. She emerged from the meeting saying she needed more time to form a coalition government, but added she would return to see the president on Wednesday with letters of support from her allies. She said a swearing-in ceremony would take place "as soon as possible". The unexpected delay sparked fresh speculation that she was in two minds about being prime minister - and Congress MPs and party allies fed the rumours all afternoon. 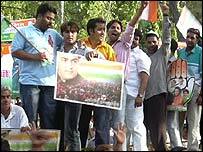 Large crowds of Mrs Gandhi's supporters converged on her home in Delhi chanting: "Long live Sonia Gandhi." One even threatened to commit suicide if she refused to become the prime minister. The defeated Hindu nationalist Bharatiya Janata Party (BJP) has led attacks on Mrs Gandhi's foreign origins, promising to boycott any swearing-in ceremony. One former minister, Sushma Swaraj, even said she would resign from parliament and shave her head as a sign of protest. But non-BJP politicians and the Indian media have attacked the party for its stand. The Times of India said in an editorial that voters had rejected what it described as the BJP's "mindless xenophobia". Reports that Mrs Gandhi was considering turning down the job of prime minister were a factor in Indian shares rebounding dramatically. A day after its biggest fall, the benchmark Bombay Stock Exchange sensitive index recorded its biggest gain in a single day's trading - up 371 points, more than 8%. Monday's stock market crash was a result of investor fears that the Communists would block economic reforms - especially privatisation of state-owned companies. The Congress party has promised the financial community it has nothing to fear. The party's victory in the general election came as a surprise. The BJP and its allies had been widely expected to win on the strength of a buoyant economy and peace moves with Pakistan. Congress has the support of some 320 MPs in the 543-member house. Communists, the party's biggest allies, have said they would back Mrs Gandhi but not formally join her government. "The charge that Sonia Gandhi cannot be trusted was hurled at her again today"
Was Sonia Gandhi right to turn down the post of prime minister? Gandhi family loyalists back in from the cold, but no fresh blood in cabinet. Why did Sonia change her mind?